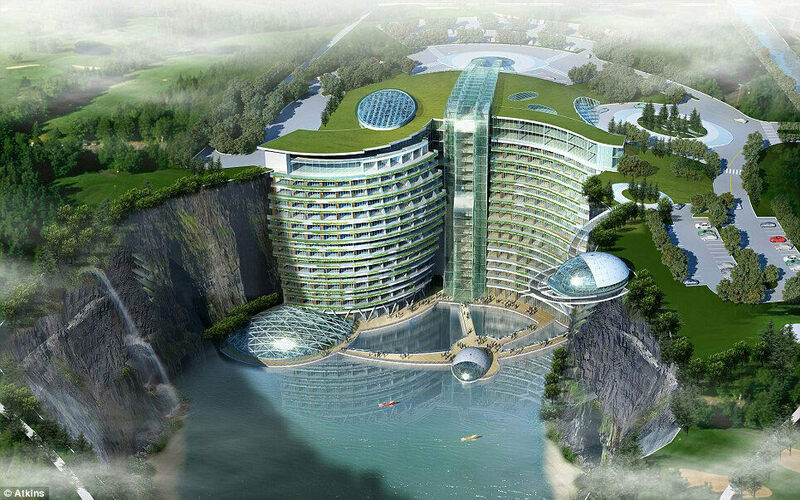 The Shimao Wonderland Intercontinental (also known as the Songjiang Quarry Hotel) is the world’s first five-star hotel built inside an underground, water-filled quarry. It has been successfully completed and opened to the public in November 2018 , it is also be one of the most eco-friendly places to stay in China. 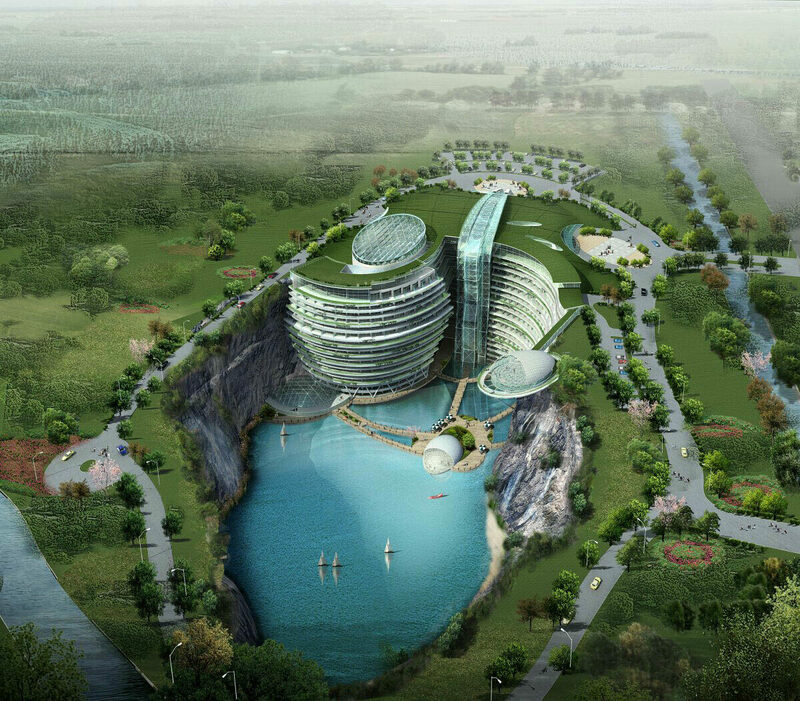 Built into an abandoned quarry about 20 miles from Shanghai, the hotel includes two underwater floors and a green rooftop that blends into the surrounding countryside. The unique design takes advantage of the location and natural elements such as the rocky cliffs, waterfalls, and surrounding hills. A glass waterfall atrium pours over the façade, where all 14 floors of above the water level rooms have balconies and views of the quarry. The underground floors include under water rooms and a restaurant that face a 33-foot-long aquarium, plus a leisure complex, swimming pool, and water sports. The hotel’s roof is above ground level and is partly covered with grass and trees to fit into the surrounding topography and preserve the local environment. 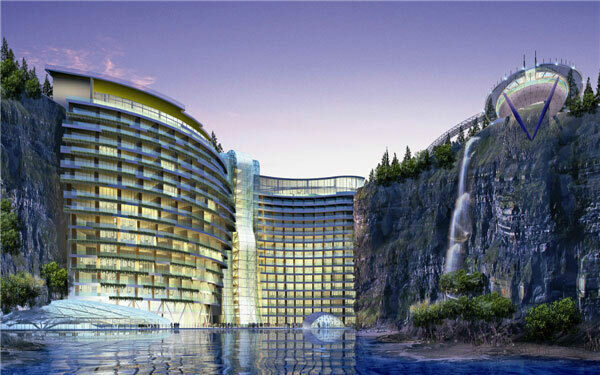 Adjacent to the hotel is a theme park with a glass walkway and observation platform overhanging the quarry cliffs. The luxury resort hotel is not only a dazzling design concept: It was built to prevent further ecological damage to the environment around it and features an extensive sustainability program. The hotel is in fact an example of ‘Passive ‘sustainability, using the micro climate of the quarry and the thermal inertia if the rocky cliffs cooling in the summer and heating in the winter. 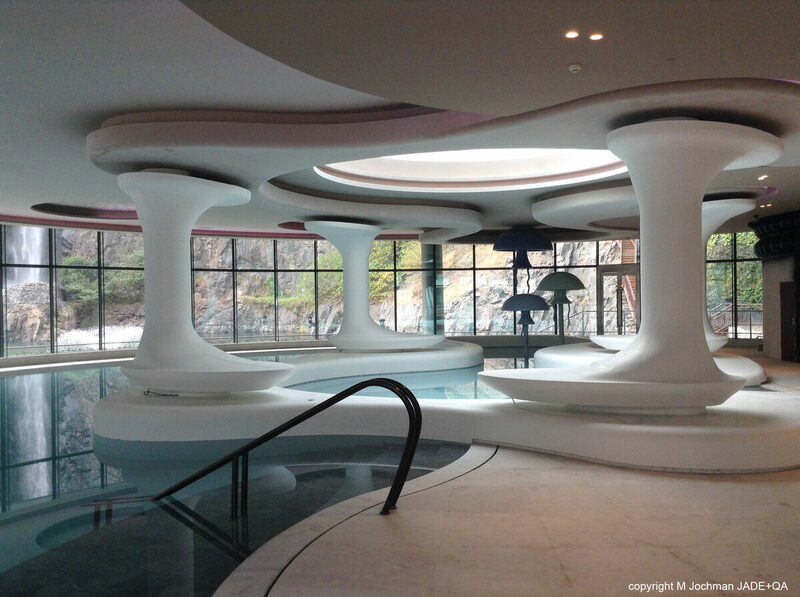 An engineering marvel, the Shimao Wonderland Intercontinental was designed by British Architect Martin Jochman, initially with the same British firm that designed the stunning Burj Al Arab Hotel in Dubai and later with his own studio JADE+QA. It took 12 years to build partially because novel solutions were needed to transport materials down into the quarry. The chief engineer called it a “fight with gravity” that took more than 5,000 architects, engineers, designers, and workers to build. The hotel is now open to the public and is extremely popular with visitors. The resort will have 337 guest rooms, a conference centre that can accommodate 1,000, and a series of restaurants and banquet facilities.